Ubriacone is a traditional, Italian cheese made in northern Italy’s Veneto region. Affectionately called “drunken cheese”, it is bathed in gallons of red wine along with skins, seeds, and leftovers from the wine making process to extract the unique sweet, delicate aroma of the wine and complex flavors. 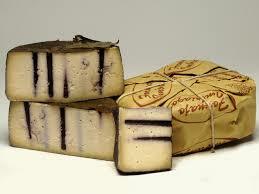 An unpasteurized cow’s milk cheese, Ubriacone is matured for a minimum of 2 months but rarely for over a year. Upon maturity, it develops a soft and supple texture, which ages to become firmer and crumbly, similar to a Parmigianino. Seasonally produced, the best season to avail the cheese is from late fall through early summer. The cheese has a flowery aroma and smells of heavenly red wine. 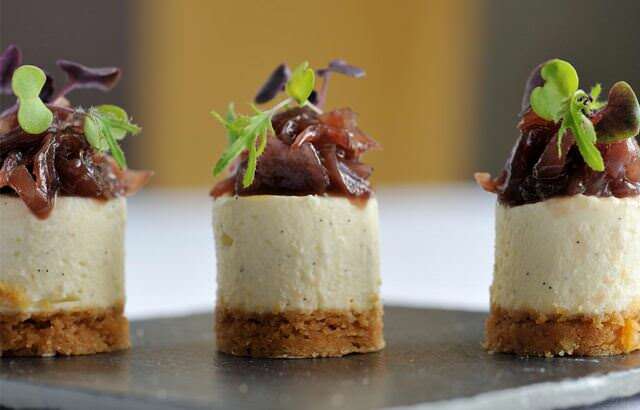 I have added the sweetness of this wine flavored cheese to my favorite cheese cake recipe for a very addictive dessert that will have your guests begging for more! Beat eggs with a mixer until foamy. Add the sugar while beating eggs continuously with the mixer. Once the sugar is dissolved, beat in the flour, followed by the heavy cream, one by one, add in the pear extract, ricotta, Ubriacone and the wine. Butter and flour a 9” springform pan. Pour in the mixture and sprinkle the top with cinnamon. Bake for 1 hour and 15 minutes, check to see if done with a toothpick, Once toothpick comes out clean, shut off the oven and leave the cheesecake in there to settle for 10 to 15 minutes more. Once cool (this will take a few hours), sprinkle with powdered sugar and serve. Mix the lemon juice, the zest, the sugar and the eggs in a medium pot on low heat. Keep stirring with a whisk. Slowly add the butter and keep stirring until the mixture turns creamy. Once the whisk leaves traces on the bottom of the pan remove from the stove and put aside. Crush the gram crackers until they are a fine powder. Stir in salt and sugar, mix well. Melt the butter and mix with dry ingredients. Press into bottom of a spring form pan and flatten out with about 1” on the sides. Bake for 10 minutes at 350. Let cool. Beat together the cream cheese and sugar in a bowl. When well mixed add the eggs one by one beating after each one. Add the sour cream and vanilla extract and mix until you have a smooth cream. Pour half the filling into crust. Spread out evenly. Now add half the lemon curd mixture. Swirl the curd into the filling with a small knife or chopstick. Repeat this step with the remaining filling and lemon curd. Bake the cake for 50 to 60 minutes at 350. When taking the cake from the oven the center may still feel soft, it will set while cooling down. After the cake has cooled 2 to 3 hours refrigerate. 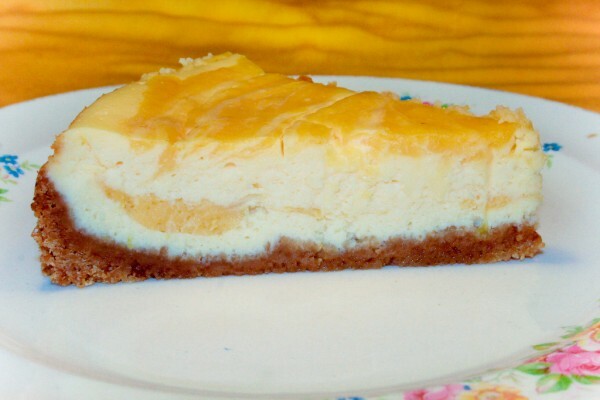 When I was a little boy I was always in the kitchen bugging the cook, there were a few things that I learned: 1) that this was Cook’s secret family recipe for cheesecake, and 2) that she always cut the end off the ham because that is the way Cook’s Grandma made the ham taste so good. Well now that I am a Chef I have found out a few things about Cook’s idea of cooking: 1) Yes it may have been Cook’s recipe, and yes it came from her head but that did not mean it was a family invented recipe, and 2) she cut the end off the ham bone all those years because her mom did, only to find out that she did it to make it fit in a smaller pan. The point of the story is to say that: 1) In cooking few things are new…usually just a twist on something already tried, and 2) just because it’s always been done that way does not mean that we can’t change it. So feel free to add or change the ingredients in a recipe and make it your own. 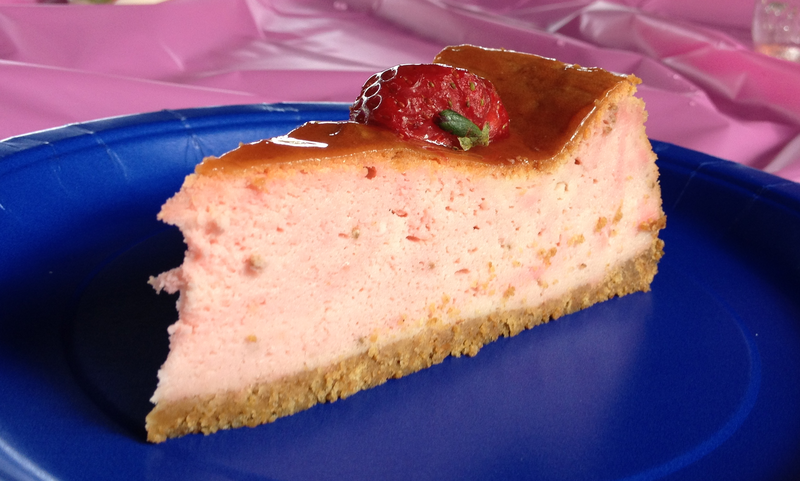 So here are my changes on a typical NY style cheesecake. In a medium bowl, mix cookie crumbs with melted butter. Press onto bottom of springform pan. Over medium heat melt butter in large pan, add peaches, stirring until warm. Add sugar, bringing to a boil. Remove from heat, add extract. 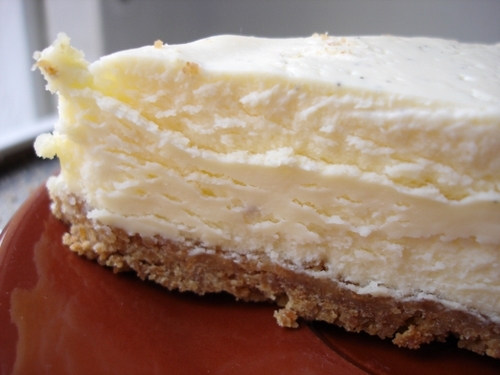 Serve warm over cheese cake or cool in refrigerator and serve cold. It taste good both ways.